Add a timelessly stylish look to your home with the Della Linen Loveseat by United Simmons Upholstery. 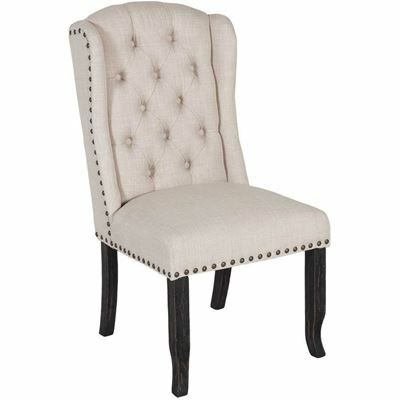 This loveseat features a classic silhouette with a low back and dramatically rolled arms paired with bold, silver nail head trim. The off-white, linen-look polyester upholstery is flecked with darker neutrals for a sophisticated, heathered appearance. Accent pillows in a medallion print and a velvet geo pattern add visual interest. Add a timelessly stylish look to your home with the Della Linen Loveseat by United Simmons Upholstery. Della Linen Loveseat from United Simmons Upholstery. Loveseat is covered in a linen polyester upholstery with a two-tone, textured appearance. Includes 1 medallion and 2 geo velvet pillows, not sold separately.